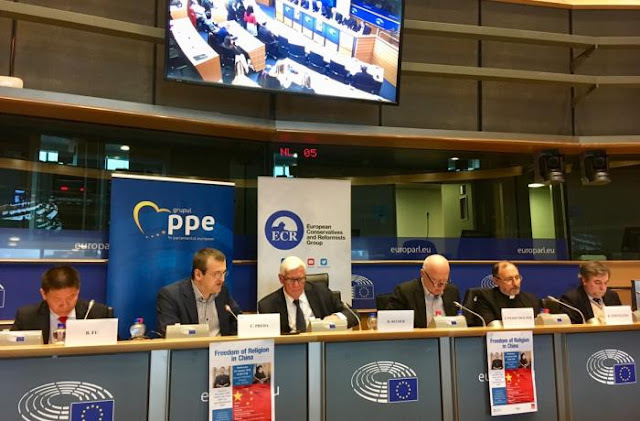 In a meeting on religious freedom in China in the Brussels office of the European Parliament, the testimonies of Protestant Christians, Uighurs, Catholics. The voices of Tibetan Buddhists, Taoists and sects. The intervention offered by the editor of AsiaNews. Brussels (AsiaNews) - "All religions in China are persecuted": This is the conclusion of Austrian Member of Parliament, Dr. Josef Weidenholzer, at a conference held yesterday afternoon at the European Parliament in Brussels on the theme "Religious Freedom in China". The meeting organised by representatives of the People's Party and the socialists, had several guest speakers who offered their witness to a packed hall. After a brief introduction by parliamentarians Bas Belder (Dutch) and Christian Dan Preda (Romanian), the following spoke: Bob Fu, founder and director of China Aid; Kuzzat Altay, Uighur exile in the United States; Marco Respinti, director of Bitter Winter; Willy Fautré, director of Human Rights without Frontiers; Fr. Bernardo Cervellera, editor of AsiaNews. From the audience emerged testimonies of Tibetan Buddhists, Taoists, sects, branded by the regime as "evil cults". Below we publish the intervention of the editor of AsiaNews. On January 14, AsiaNews published a "Christmas diary" written by a Chinese priest, Fr. Stanislaus, who recounts the difficulties experienced by Chinese Catholics in a province of the Northeast. For "security" reasons Christmas Masses must be controlled by the police; young people under the age of 18 cannot take part; the New Year banners of good wishes, which the Chinese hang on their doorstep and with which Christians wish peace and blessings from God, cannot be sold. On the same day, the foreign ministry spokesperson, Ms. Hua [Chunying], said: "You do not understand China. Do not you know how many Buddhist and Taoist temples and Christian churches in China operate legally? According to the law, Chinese citizens enjoy full religious freedom! We have taken preventive measures against terrorists and extremists, to allow so many ordinary people to fully enjoy normal religious freedom! " Perhaps in China all young Catholics under 18 are considered "terrorists", forbidding them to attend Christmas Mass, Sunday Mass, and catechesis. To allow them to "fully enjoy religious freedom", in primary and secondary schools of various provinces of China (Anhui, Henan, Inner Mongolia), representatives of the Ministry of Education have forbidden pupils and students to celebrate Christmas ( and the Lunar New Year), to exchange gifts or to participate in religious ceremonies; in several provinces (Hebei, Shaanxi, Yunnan) Christmas celebrations and decorations were forbidden in the cities, seen as "an attack on Chinese culture", a submission to Western "spiritual pollution". Apart from the historical error of considering Christianity as a "religion of the West" (given that Jesus was born in Asia and that Christianity arrived in China in the 7th century from Iraq), it is clear that the Chinese Communist Party is conducting a veritable "religious war" on Christianity and Catholics, all in the name of "security" and "nationalist patriotism". In the name of security, religious activities are divided into "normal" and "illegal", although there are no differences in rite or execution between the two. What makes a religious activity "normal" is its submission to the control of political authorities: bishops, priests, places of worship registered with the Ministry of Religious Affairs; registered publications; registered pastoral plans; registered times; registered participants. Added to this are the ubiquitous cameras in the parish offices; the permits to ask to meet Chinese or foreign Catholic personnel; the continued presence of the police around or inside the places of worship. "Illegal" religious activities are those carried out with personnel or in places that are not under control. The Catholics who carry out these activities, defined as "criminals", claim their freedom as guaranteed by the Chinese constitution, but risk arrests, fines, expropriation of buildings, or their destruction. In 1994, the UN envoy for religious freedom, Abdelfattah Amor, asked China to eliminate this difference between "normal" and "illegal" activities, but this request went unheard. It should be noted that this division - inserted by the government - creates the so-called official Church (of "normal" activities) and the underground (or unofficial) Church. The instrument of this division is the Patriotic Association, guarantor of "normality", whose statutes violate the integrity of the Catholic faith because it wants to build a Church "independent" from the universal Church and the Holy See. Official Church members agree to register as the "lesser evil"; those of the underground Church categorically refuse to register. But both communities suffer violations of religious freedom and risk elimination: the former from a suffocating control; the latter from arrests, disappearances, killings, destruction. The situation has become even more radical with the launch of the New Regulations on Religious Activities on February 1, 2018. Under the new regulations the official communities must submit to the control of the dimensions, colors and position of crosses; the height and position of statues; texts posted online, with a ban on the live streaming of all ceremonies. The underground communities do not even have the right to exist. Activities carried out in unregistered places and with unregistered personnel are subject to heavy fines: between 100 and 300 thousand yuan for "unauthorized" activities (Article 64). In addition to incurring fines, sites that host "illegal" activities will be closed down, seized and subject to forfeiture in state assets. For several months police and representatives of the Religious Affairs Bureau have been systematically meeting bishops, priests and lay faithful of the underground communities for "a cup of tea" and "to advise" them to register in the official communities.] This explains the various "forced vacations" of Wenzhou bishop Peter Shao Zhumin, or the indoctrination classes of priests in Hebei, Henan, Inner Mongolia, ... Underground bishops and priests are “advised” to register in the official communities, taking them to "forced vacations" or to “indoctrination classes”. It is our duty to at least name the victims of this persecution: Msgr. James Su Zhimin, undergournd bishop of Baoding (Hebei), who has been missing in police custody since 1997; Fr. Liu Honggeng of Baoding, missing since 2015; Fr. Wei Heping (also known as Yu Heping), who died in 2015 in mysterious and suspicious circumstances. There are also victims in the official Church: Msgr. Thaddeus Ma Daqin, bishop of Shanghai, since 2012 in isolation and under house arrest for having dared to leave the Patriotic Association; Fr. Liu Jiangdong, of Zhengzhou (Henan), expelled from his parish in October 2018 and forbidden to live as a priest, for having dared to organize meetings with young people even under the age of 18. For all of this, since February 2018 many communities have been forcibly closed, convents and places of worship destroyed with bulldozers, including some shrines in Shanxi and Guizhou. It is estimated that in 2018 at least 30 Catholic churches have been closed and destroyed. But there are also churches (official) that are destroyed in the name of urban expansion - as in Qianwang and Liangwang (Shandong) - and whose land is seized for building development without any compensation. Another method of submission and elimination of Catholics is nationalist patriotism, or "sinicization". According to the dictates of Xi Jinping, the Church must not only assimilate Chinese culture, and express its creed with Chinese categories, but must create theologies, history, works of art according to the dictates of Chinese culture. Again it falls to the Patriotic Association to verify this is being done. But the race for inculturation has also become iconoclasm with the destruction of works of art from the past ("too Western") and that of external and internal church decoration, the demolition of crosses from bell towers, the destruction of domes and facades considered "not Chinese in style". Patriotism obliges communities to hoist the Chinese flag on every religious building, to sing patriotic hymns before services, to hang a portrait of Xi Jinping even on the altars. The provisional agreement between China and the Holy See, signed on September 22nd 2018, has not changed this situation. It is true that in some ways, the agreement is a conquest because for the first time in modern China history the Pope is recognized as head of the Catholic Church in China. However, last December, Wang Zuoan, deputy chief of the United Front and former director of the State Administration for Religious Affairs, once again stressed that the principles of independence and self-management will not be eliminated "at any time and under any circumstances”. In words reportedly shared with one [of these] underground bishop [s], the Pope is said to have referred that if the agreement was not signed, China threatened to illegally ordain 45 bishops "independent" from the Holy See, creating the basis for a real schism. The agreement was therefore blackmail. In addition, immediately after the signing of the agreement, in many regions of China the United Front and the Patriotic Association held rallies for priests and bishops explaining to them that "despite the agreement", they had to work for the implementation of an independent Church. The destruction of crosses, churches, indoctrination sessions, arrests continued just as before the agreement, if not worse. 1. It is clear that the government and the Chinese Communist Party are engaged in a real religious war to oust the God of Christians and replace Him with the god-Xi Jinping, which implies a total submission to the Communist Party, a condition included in the New Regulations to nurture religion in China. In the name of the sinicization and subjugation religions are distorted until they become simple instruments of collateral support to the Party. 2. What happens to Catholics, also happens to civil society and the business world. In recent years, control of media, social networks, the population, NGOs has grown ... and even in the business world, submission to the Party is required, on fear of kidnappings, arrests and convictions. 3. China ploughs ahead undisturbed trampling on religious rights, civil society and commerce thanks to the indifference of the international community or the servility of many states which in view of possible, rapid economic gains with the Chinese market, turn a blind eye to these violations. 4. The international community and the Chinese government suffer from myopia: they do not realize that religions - not only Catholicism and Protestantism - are spreading ever more rapidly just as esteem for Party politics is diminishing. The result is an erosion of Chinese society and a greater need for political and economic reforms. Ensuring religious freedom for Christian communities and other faiths could help China to achieve greater cohesion by saving it from chaos.